watch out kids, i’m a bad thrower | you seem nice. if you’re reading this, i want to congratulate you on surviving new year’s eve. before hittin up the final day of 2011, i really really really really REALLY want to tell you about this movie called being elmo. yes. i most definitely mean the red, fuzzy, hugger-lovin muppet. why? because it’s amazing. that’s why. i managed to sway/trick/beg amanda and jeff to see it with me last week. we got there a little late because it was only being shown at the museum of fine arts and parking a lil ridic. umm, did you know they have an auditorium for movies? i didn’t. you can see what’s playin righ hrr. so in the documentary they go to the muppet factory. they have a whole drawer full of mustaches. i looked over at amanda at this point and she said, “that’s my dream.” i definitely thought of how many mustache themed parties they could have slash probably have. jealooouuus. so i super recommend watching it when you can, because it could be considered life-changing. too much? too bad! seriously. watch it. and now on to the ridiculousness that was the end of the year. here’s the thing, i don’t really know what happened. not because i was in an immense state of inebriation but because i honestly don’t know how the night transitioned into all of the experienced activities. it was kinda like a dream, when all of a sudden you’re somewhere, someplace doing something. no recollection of how you ended up there…just that you’re there. – lit some fireworks. as in everyone but me lit fireworks. i don’t mind fireworks, i mean, i thoroughly enjoy them, but strikin a match and lighting something that will be exploding in seconds scares me. irrational fear? shut your mouth, no, it’s not! 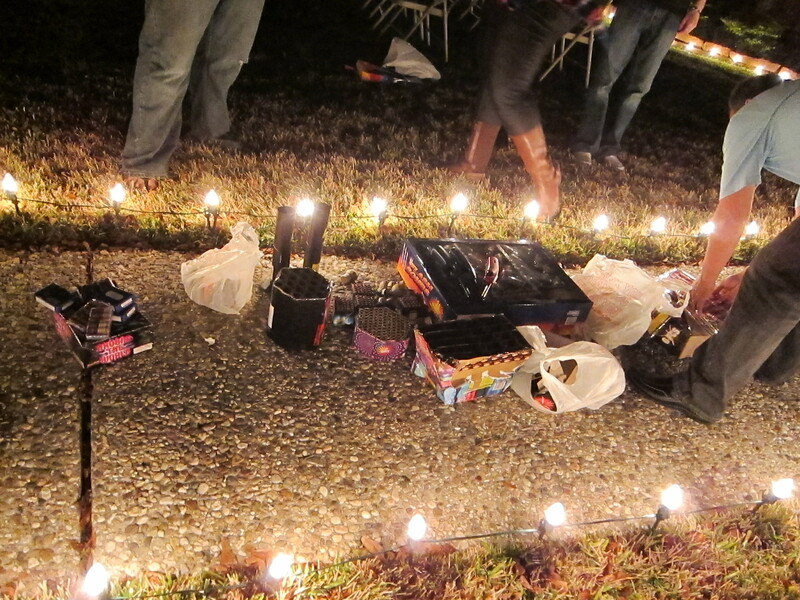 also, sparklers. lighting those things scare the crap out of me because all of a sudden it starts hissing and spitting sparks. and then combine that with wind and/or standing next to someone with theirs lit AND the wind element…it was terrifying. 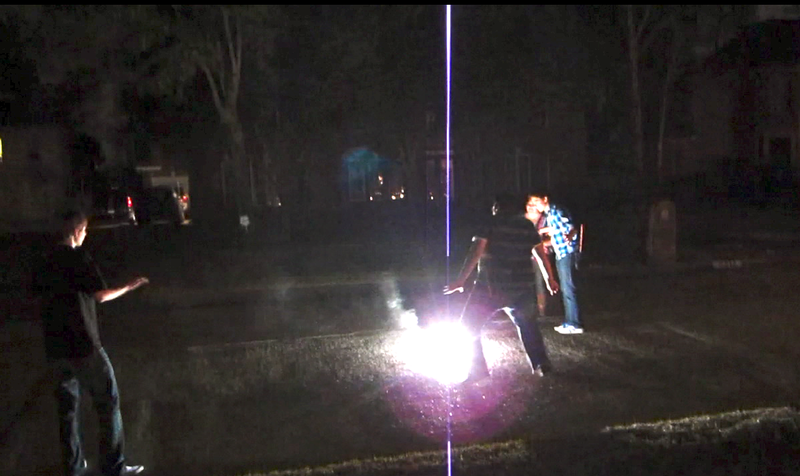 they're dancing around a firework-type object. it strobed. 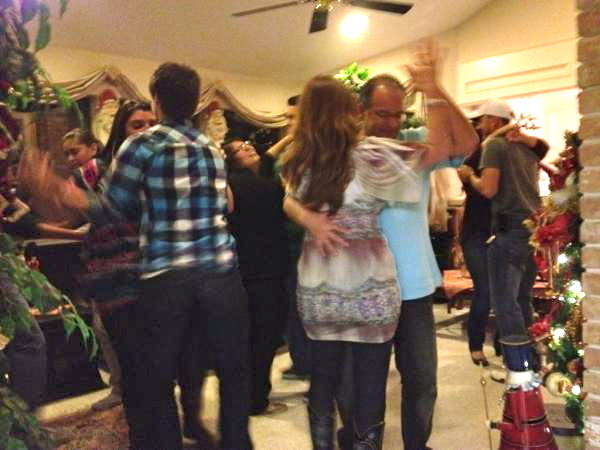 – salsa dance party in the living room? next thing i know michael’s trying to suffocate me because he overestimated my height…as in lack thereof. i swiped this pic from jeff’s twitter feed. sorry, not sorry. – moved back to the original dance party area because mr. adame poured us tequila shots. those were terrible. so now the year is full of work, weddings, graduating (hopefully! ), more weddings, finding a job, and even more weddings. if you’re in a rut, i hope things improve. if you’re feelin on top of the world, i hope it continues. i know you’re the beginning of the end of the world and everything, but maybe we can make a deal and be really good pals. just an idea. One, If you were taller, I wouldn’t have suffocate you. Maybe that’s something you can work on in 2012? Two. I kinda wanna see that elm movie now…so thanks for that. Three. I finished catching fire, and am entranced in Mockingjay. We should have a discussion of all three when I have competed the trilogy.